Standing in stark contrast to competing gaming chairs, the noblechairs HERO offers a solid steel frame ensconced within its upholstery. The entire seat is coated in 1,5 mm thick PU-leather, something that also contributes to the chair's outstanding durability. 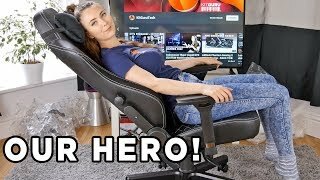 More links for "HERO Gaming Chair - Black"
Only had the chair for a few days and im impressed with it.Its a great chair, extremely well built a big improvement over my corsair t2 road warrior,This noble hero just oozes quality,no squeaks no rattles just a good solid chair a joy to sit on. Comparing this HERO Series to my old DX Racer King Series, they are not comparable! The Noble Chair is so much better in every way. The quality, the comfort, and I personally think it looks much better too! 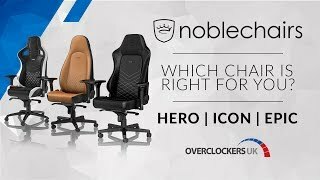 The noblechairs HERO comes at a price but we think its a great combination of ergonomics, quality and style.